MORE INFO WILL BE COMING IN 2011 !! Bramlett Johnson didn't know what he was starting in 1952 when he decided to bring back oysters from the Gulf of Mexico to share with friends and family! The story goes that he purchased a gallon of oysters while he was fishing off the coast of Texas. 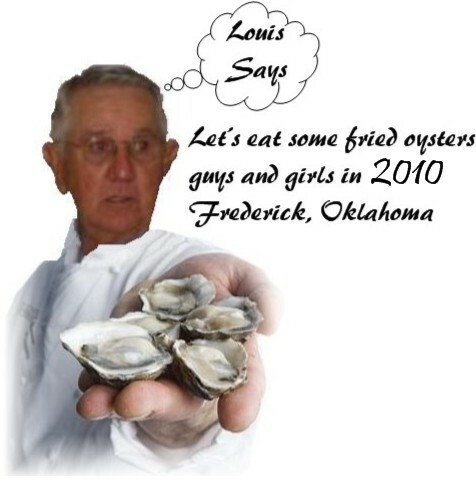 When he returned to Manitou, Oklahoma, he prepared the oysters and served them to his family, the Manitou school board, teachers, and their families. Everyone enjoyed the meal so much that the idea of holding an annual oyster fry as a fund-raiser for the Manitou PTA was suggested. As they say, the rest is history!! The first year of their official fund-raiser Oyster Fry, the Manitou PTA purchased 4 gallons of oysters and charged $1 a plate for the dinner. The PTA made $30 free and clear that first year (1953). They continued to hold the Oyster Fry each year, and it grew a little bit bigger each time. People came from all over Southwest Oklahoma and North Central Texas to get their fill of oysters, fried and raw! In 1983, the Manitou PTA served 120 gallons of oysters to 724 people. That was the last year the event was held in Manitou. The price of oysters had risen to the point that it was not as profitable as it once had been. It was harder and harder to find a place big enough to serve everyone and to find the dozens of volunteers needed to prepare, cook, serve, and clean up after the event. It was decided to discontinue the event after 30 years!